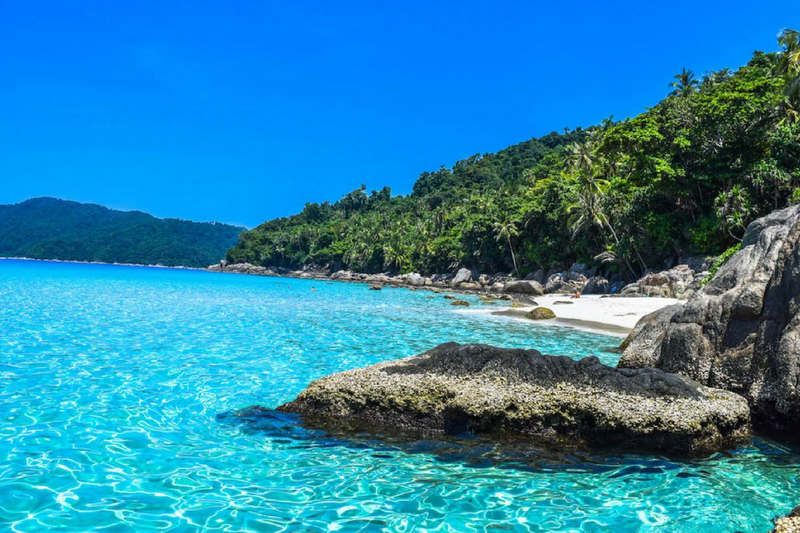 Surrounded by lush greenery, sandy white beaches and sparkling warm blue sea, Perhentian Islands is the perfect marine paradise destination for a laidback family vacation with a difference. Endowed with some of the world’s best pristine beaches, diving spots and romantic getaways, this paradise promises an unforgettable holiday experience for those who would venture there. Located in Terengganu and being one of the main tourist attractions in Malaysia, this wonderful beach paradise is made up of two islands; the Perhentian Kecil (Small Island), which is a ‘party island’ and Perhentian Besar (Big Island), which is more for a family vacation. At the Perhentian Island Resort, one could opt for jungle trekking up the hillside while walking under a canopy of large trees. The jungle is famously known for its magpies, fruit bats, Nicobar pigeon, monitor lizard, cute silvery lutungs and large spiders, which are found between the Long Beach and beautiful Coral Bay. For visitors who love swimming, scuba diving would be the main favourite activity as divers could gaze at the breathtakingly beautiful sight of corals, fishes, sea turtles and different species of sharks. On the other hand, snorkeling activities are also available at Pulau Perhentian as there are snorkeling tours all around the islands such as the Teluk Pauh on Perhentian Besar, Shark Point and Tanjung Basi. Kayaking activities are also popular at the Perhentian Islands. Meanwhile, for those who would like to take a break and lounge on the Long Beach, there are umbrellas and hammocks for visitors to nap and relax. Meanwhile, at the pristine Turtle Beach; visitors could also watch the turtles lay their eggs and even witness baby turtles crawling slowly to the sea. The beach has a stunning bay with lots of shady areas while snorkeling activities are also rampant around the area. Sting rays, cuttlefishes and other tropical fishes could also be found in the sea at this area. As the night approaches, visitors could enjoy watching the sunset at Coral Bay. Meanwhile, there are also some small and private beaches at D’Lagoon, which are perfect for a little getaway. Other night activities include hula and fire dancing near the Bubu Long Beach resort.